Attention! 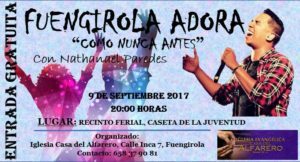 We need volunteers for an event on 9 September at the “Recinto Ferial” in Fuengirola. We are looking for people to help us in the event for a few hours. All funds raised will be for our activities and the maintenance of the association. If you are interested, contact us through a private message leaving your telephone number and we will contact you to give you more information, or to our e-mail info@adintrefoundation.com. If you can not help us, please share this, so we can reach more people. Thank you!